We have another round of Intervals features and updates to announce. Read on to find out more about what has recently been improved. We’ve added more flexibility to an already robust task management system. 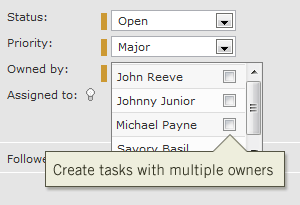 In addition to multiple task assignees and followers, we’ve enabled tasks to have multiple owners. This update is especially useful for teams that have multiple people assigning, verifying and closing tasks. Sharing tasks across multiple owners is useful for keeping certain tasks on time and budget, tasks that don’t lend themselves well to a single owner. For those who prefer to enter multiple time entries at once, there is now a page for that. Simply click on the Time tab and select “Add multiple time entries.” Perhaps you’ve been out of the office for awhile, at a trade show, on the road or in the field, and you would rather enter all of your time at the end of the day or end of the week. Use this feature to quickly and accurately add multiple time entries at once across different clients, projects and tasks. We know it’s going to make our own lives easier each year when were at OSCON and SXSW. We’ve added three additional data imports to help you migrate from other project management applications to Intervals. It’s also quite useful for copying your data from one Intervals account to another. 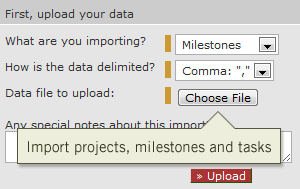 Projects, milestones and tasks can all be imported now from any text file. Got a bunch of projects lying around you need to get moving on? Import them. Been holding off on using Intervals until you can find a way to get all of your legacy tasks entered? Import them, too. The additional data imports should make it easier than ever to get started using Intervals and bring over data from another system. The ability to right-click on items and update them has been extended to additional areas of the site, including milestones and invoices. We’ve also added more items to the right-click menu, giving you the ability to do more with fewer clicks. Close out tasks and milestones, add time to tasks and projects, and delete milestones and similar items with just one click. Creating a new project for a new client? Enter them both on the same page, saving yourself the trouble of having to enter the client separately. Add the client’s name when creating the project and the client profile will be created and associated with the project. Just another way to make Intervals a more intuitive and streamlined online project management service. Different businesses invoice in different ways. We’ve loosened up the invoice formatting to allow you to do everything from using prefilled invoices to building your own freestyle invoice. More specific with this release, we’ve allowed for invoices to have line items amounting to a zero amount. There are plenty of scenarios where a business might need to list items on an invoice that were not charged, this change now allows you to do that. Each month the Intervals administrator receives her invoice detailing the charges on her credit card. However, there may be other people within your business who need to be kept in the loop, for example, a book keeper or accounts payable department. 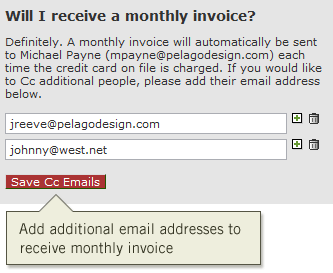 Now you can Cc additional email addresses and have them receive this monthly Intervals invoice as well. To access this feature, login as an Administrator with Plan Info access and go to Options -> Plan Info -> Billing Info. 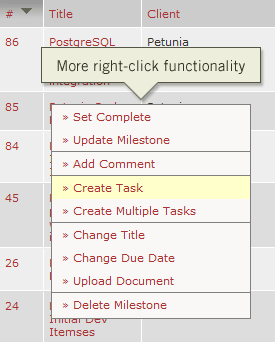 You may also notice a slight change in the button layout when adding task comments. We’ve revised the add, save and cancel buttons to make them more visually consistent with similar functionality throughout the application. It’s another small update — but worth mentioning — in our commitment to continuously improve Intervals. Wow — these are improvements that I would have asked for, if someone would have interviewed me in a focus group. I’m grateful to have thrown my hat into the ring of a group that is making *relevant* and needed upgrades and I hope and pray that Intervals will keep on keeping on!